The front shocks that Honda installed on this bike are good shocks, however they do have room for improvement. There are several issues that need to be addressed. 1. Spring rate – With the single rate spring that came on it stock, you do not have as much sag adjustment as what some are wanting. With our dual spring setup it lets you lower the front of your bike while still maintaining good bottoming resistance. 2. 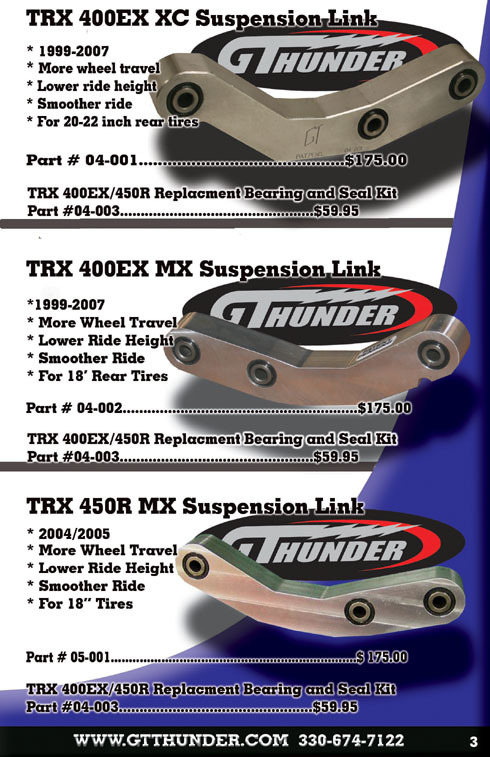 Compressed length – The compressed length of these shocks is too long to run a good sag setup. If you run a good sag setup, the shocks will bottom very easily while the frame is still several inches off the ground. We now have tooling in house to modify several shock components to let us shorten the compressed length and gain 7/8 inch shaft travel, giving us more options with this shock then previously thought possible. 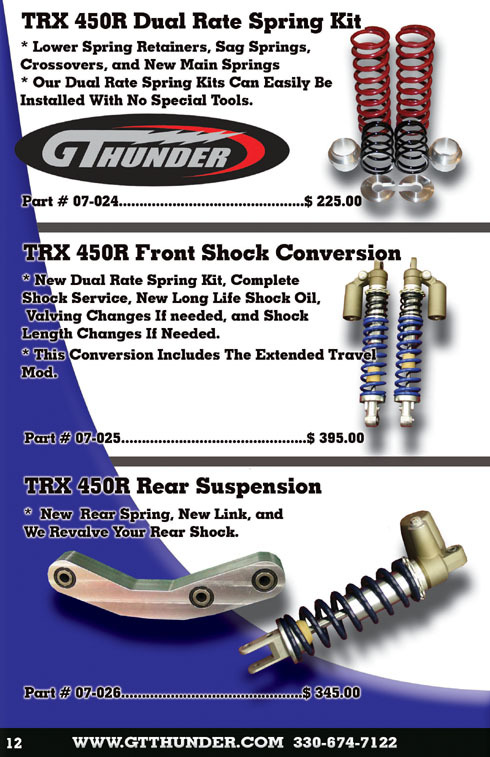 This front shock travel extension mod is all part of the front shock conversion price. The rear suspension of the 450R has several issues that we address. 1.Insufficient up travel of the rear wheels. 2. Insufficient wheel travel for serious racing. 3. Rebound valving that is very fast. Even with the rebound adjustment turned all the way to the stiffest setting the rebound is still to fast for good handling. 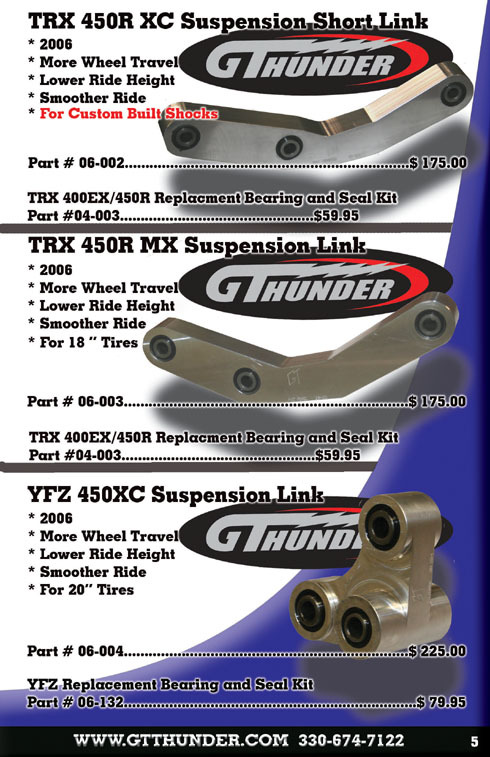 We have designed several new rear linkages to help correct these issues. with added up travel of the rear wheels, added wheel travel and a good progressive rate in the rear setup, you can get greatly improved ride quality. With these new rear linkages - you also then have an increased leverage ratio at the shock, creating a need for additional valving and sometimes spring changes. While we are in the shock adjusting the compression valving, we also correct the rebound valving at no extra charge. 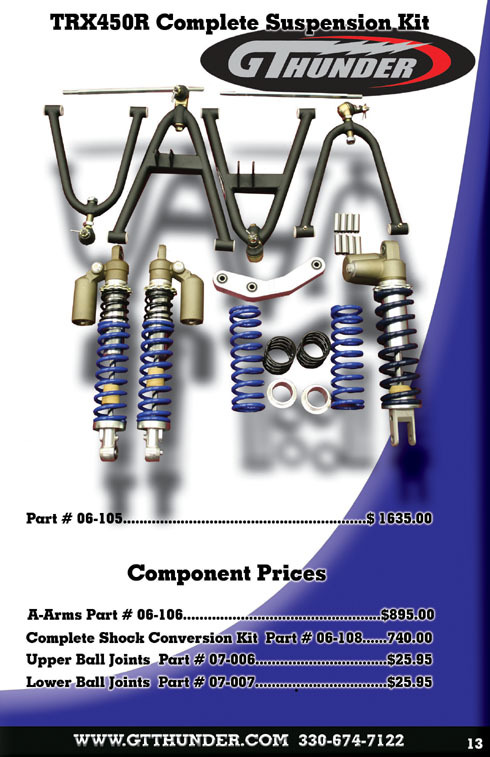 Dual rate spring kits include upper black springs and either blue or maroon lower springs - Note: we have no choice on spring color - spring color is determined by the spring rate and what is available. 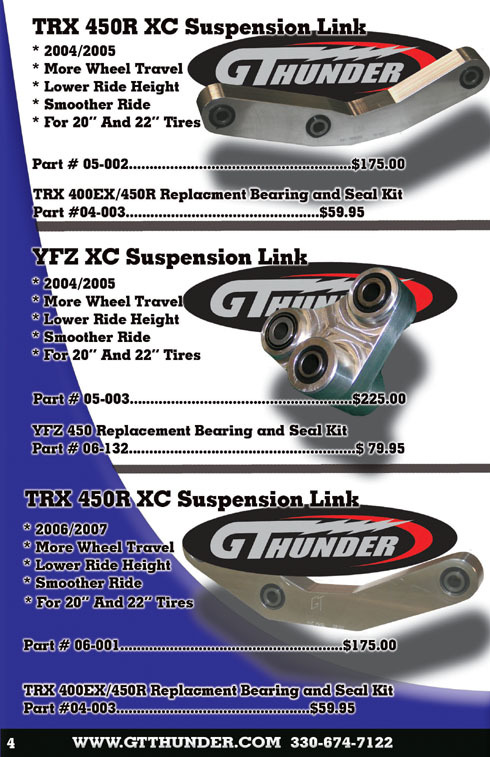 Below are 3 links to comparison runs made on the dyno comparing the TRX450R to the YFZ450. Both bikes were stock, both bikes had about the same amount of break-in time, both bikes were dynoed under the same conditions including 30MPH air blowing across the bike. Interesting thing with the Honda was the ignition was going into a double spark condition at 8400 rpm. The Honda was hitting the rev limiter at 9200 rpm, however on the runs below you will see the graph for the Honda stop at 8400 rpm on all the runs that are based on rpm. You can see the full spread on the run that is speed based. In all the graphs - the blue is the YFZ and the red is the TRX. Replacement Nets for heel guards. 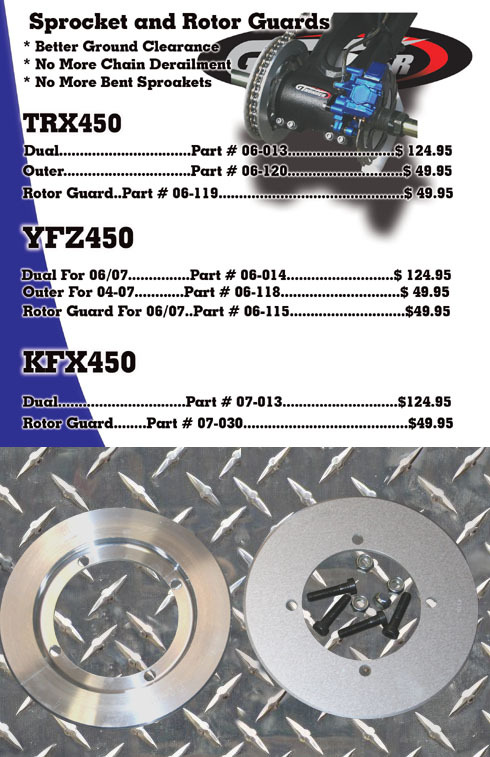 Pictured is one lower and one upper - price is for one ball joint.